Needless to say about my hubby he is becoming a kiddo day by day. Lunch bag comes home so empty when I pack sandwich and noodles, unlike rice which comes back home not empty. I was worried about his unhealthy appetite, because I used to make sandwich entirely with a potato. I told the same thing to my mother and she tried her best to fix this issue by sending this recipe of a healthy sandwich. 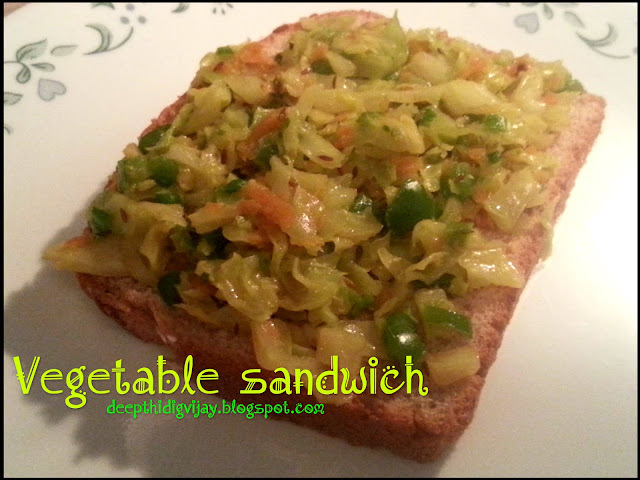 She experimented with different vegetables and finally came up with this recipe, we loved it. She used Hudson Canola oil to make this sandwich and she said they tasted better when made with this oil. They fell in love with this oil as soon as they started using it and now they use this oil to make curries and roti's. Everything is great about this product except the price, I felt that it was little over priced otherwise it is perfect for every family. Heat oil in a pan and add cumin seeds, when they splatter add onions and cook till they are tender under medium flame. Add remaining vegetables and cook till they are tender and add chat masala, salt, chili powder and garam masala powder. You can also add lemon juice if you like, it gives a fresh flavor during lunch time and keeps sandwich fresh for a longer duration. 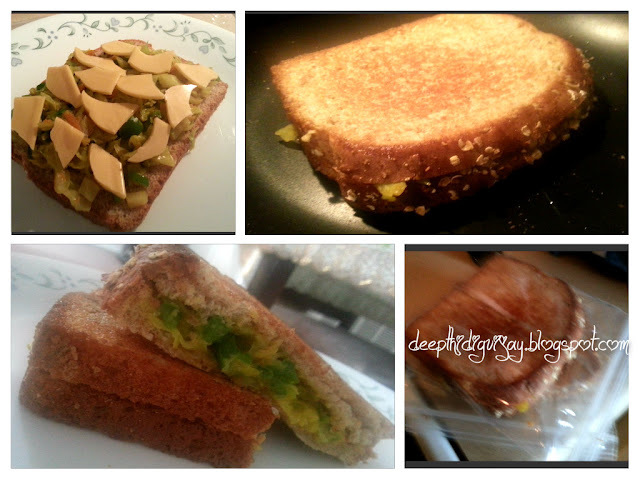 To make a sandwich, apply vegetable filling on one slice and add some cheese on top (optional, but kids will enjoy) cover it with another bread slice and toast it on both sides with some canola oil till it is crisper on both sides. Let it cool and cut it through the middle diagonally and pack it in the sandwich bag or zip lock bag. You will love it! Kindly leave your comments in the box below. Thank you for stopping by! this is good sandwich recipe! i love it. perfect for diet.